Reservoir pumps - Fill it and forget it! Meziere reservoir pump is the most innovative solution for those difficult-to-fill systems. It was specifically designed for dragsters where the radiator is laying down flat; either in the front of the driver or over the transmission. It has also proven to be a great help in some kit car applications and other situations where the radiator is inaccessible. Its integrated surge tank makes these systems easy to fill in just a fraction of the time. This pump provides a cure for the problems associated with low and horizontal mounted radiators. The built in expansion tank serves as a fill point and air separator. With the pressure cap located at the correct spot in the system, the system fills easily with the pump running and maintains the level by purging accumulated air before any water escapes. With a head of water above a self priming pump cavity, this design eliminates air locking and cavitation. Light weight. Complete standard small block Chevy unit weighs only 8.2 pounds! Distributer Belt Drives: This pump will not clear belt drive distributor systems. Pump Weight: This application weighs 8.2 lbs. Additional Notes: The standard 35GPM pump is suitable for normally aspirated engines up to 650HP. Supercharged, turbocharged and high compression, high horsepower applications should use the 55GPM High Flow pump only. This model does not accept heater or bypass hoses as a standard. Built to Flow 35+ Gallons Per Minute! Mezieres aluminum 200 Series Electric Water Pumps are lightweight and flow 35+ gallons per minute. The pump housing, motor cap, and impeller are CNC-machined from 6061-T6 billet aluminum for superior corrosion resistance. A stainless steel impeller shaft runs through a carbon-ceramic seal that isolates the epoxy-coated motor from coolant for lasting reliability. The motor has a radio frequency suppression circuit to reduce ignition/RF interference. There are two motor options: standard duty and heavy duty (heavy duty offers more power and RPM with increased flow and pressure for street cars and other continuous applications where high-flow pumps aren't available). Most of these water pumps have 1'' NPT port(s) to direct flow using an inlet adapter of your choice (sold separately). Meziere offers extensions, longer inlets, and angle adapters if needed. A great solution for problems stemming from radiators that are mounted low or horizontally, 200 Series Electric Water Pumps have a built-in expansion tank to act as a fill point and air separator. Returning the pressure cap to the low-pressure side allows easy filling of the system while the pump runs, and the level is maintained by purging air before any water escapes (i.e. air locking and cavitation are eliminated). Though specifically developed for dragsters where the radiator is placed flat in front of the driver or over the transmission, this design can help other vehicles with an inaccessible radiator. 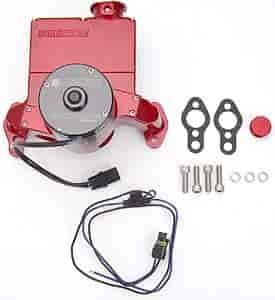 Click on engine below to see your new Meziere 200 Series Electric Water Pump!